Is there ever a medical reason for using the Birth Control Pill? One of the troubling things about Catholic discussions of appropriate therapeutic use of “the pill” is that most people who are black-and-white assertive types don’t actually know what they are talking about, and the experts who do know what they are talking about confuse people. For instance, what is your first thought when reading this Catholic expert answer? Q: Is there ever a medical reason for using the Birth Control Pill? There is always an alternative which may uncover the problem which caused the gynecologic disorder for which the pill was prescribed. There is always a reason why women don’t ovulate normally, have intermenstrual bleeding, have pain or infertility. To prescribe the pill for these symptoms may delay or prevent a diagnosis. Source. Do you see what that actually says? You might think that it is a very long drawn out “no” but that isn’t what it says. What it basically says is that prior to going on the pill there is always an option for diagnosing the actual source of the issue. Going on the pill without investigating the issue might mean risking a lack of correct diagnosis. But this says nothing about whether there will be non-pill remedies once a diagnosis is made, or whether the diagnosis will be helpful for anything other than having a nice name for one’s symptoms. The real answer is that yes, there are sometimes medical reasons for using the pill, and even NFP only doctors will prescribe it for therapeutic reasons. One can hope that they will first do a good job of making a correct diagnosis and then exhausting other options for treatment, but sometimes the same hormones that are used for contraception can also be used to eliminate pain and preserve fertility. It is confusing and troubling to some, but it is also reality. And it is probably better to simply not address the subject if one is unable to address it fairly. Note to those who think that it is not fitting to admit sin on blogs: please do not read, and certainly do not comment on this post. This is a serious, and not sarcastic post. Most of my (short) adult life I have been aware of an underlying sin of pride. I cannot describe it as a “struggle” because it is only on very specific occasions that I bother to struggle with it. As with most of the worst evils, it simply does not seem as bad as the lesser sins that attract more attention and demand to be stamped out rightnow. I have often been confused by those of my acquaintance who are arrogant. And they are many, for while I love humble people, I am constantly attracted to those who are arrogant. I misconstrued their arrogance as the same as my pride, and so often wondered how they could be so careless about appearing stupid in their arrogance. In the beginning of our relationship I would get upset (and I mean genuinely distressed, not angry) at Josh for being confident when he turned out to be wrong. At first when we disagreed over some factual matter I would be inclined to back down because he was so matter-of-fact about simply being right. Then, when it turned out that I had in fact been correct, I was unable to understand how on earth he could have been so dogmatic without actually being right. Why on earth would he not have at least allowed the possibility that he was mistaken? It turned out that he was simply rather used to being right and did not find it worth his time to qualify statements that were always true. He was often perfectly willing to modify his view when it was shown that he was, in fact, incorrect. But since he was accustomed to being right it seemed natural to him to always presume that he was right. The week before Lent Josh asked me about the guidelines for fasting and abstinence. I told him what I thought they were, with the appropriate qualifiers about my memory and went immediately to look the rules up online. When I read the actual rules to Josh he said something indicating that what I was reading was not necessary since it was only confirming what he already knew. I do not remember what I said to express my “what the?” about the fact that two minutes before he had been asking me about something which he now indicated he already knew. Josh clarified that he found the official source unnecessary because I had said that I was pretty sure of the rules and I was “always right” about such things. He already knew because I had just told him. I was rather amused (though of course I should have been annoyed) that his arrogance had now extended to his view of me! I still think that I should verify anything that I cannot precisely remember from an authoritative source, and Josh now thinks that he does not even need to double-check things on which I am fairly certain! On reflecting on my pride-arrogance relationship with Josh it is surprising to realize that the most obvious sin was rarely an issue. The same cannot be said for my interactions with arrogant e-friends. Something about the internet makes people stupid. It happens frequently on blogs, but I first realized the extent of the problem on Twitter. Twitter is a 140 World of Arrogance. It is, of course, partly that like attracts like and I love arrogance, but it is also partly the nature of the sea-beast. Fast and concise tends to boil down to arrogance, or bring it to a boiling point, or some other boiling metaphor which you will already know if you are a part of my Twitter world. Fairly soon after I started @VitaCatholic I saw pride in my own stream1 and so I began to make a point to undercut it. Whenever I saw a chance to stop the pride-game by admitting my ignorance or fitting in disclaimers I would do so. And then pride really became a problem. I told Josh my dilemma. In trying to eliminate arrogance I had inadvertently fed my pride. Now others would say very stupid things to me because they assumed that my lack of arrogance reflected ignorance, and then my pride would kick in and I would wonder why anyone would be so stupid. Josh offered practical tips. Apparently my version of concise non-arrogance was a problem for arrogant literalists. Josh told me to never say that I “knew nothing” about a subject in which I had taken a class or read a few books. To me it is a concise way of saying that I am aware that my view probably needs to be refined significantly and that I may not even be confident enough to do anything other than play devil’s advocate. But Josh thought it an obvious invitation for eager Arrogants to chime in with what I would consider to be less-than-nothing. Practical tips were helpful, but I was still bewildered by others willingness to set themselves up for stupidity. When others challenge me and I know that I am right, I wonder whether they have access to something I do not. Perhaps they have read secret Vatican archives and I really should reconsider my view. After all, it is not like it would make any sense for them to tell me that I am wrong when I know that I have facts on my side, so there must be something that I am missing. It simply would not make sense for someone to tell me that I am wrong without so much as checking the catechism or canon law, or a few letters by Pater Deserto-Obscurus. If I thought someone was wrong I would first do a bit of fast fact-checking and then phrase my challenge in a way that made it clear that while I doubted their claim I was quite open to having it clarified and supported. After all, I assume that others are equally prideful and do not want to say things that are incorrect. It was only when I realized the importance of distinguishing pride from arrogance that I began to understand the situation. While others are more arrogant than I, they do not have the deep underlying pride which checks my words and sends me fact-checking. Others will off-handedly say presumptuous things because they are arrogant, but their arrogance is an acceptable personality trait. Being arrogant has its downsides, but it also enables one to share crucial information in a timely manor, to inform and correct others without doing a lot of work. The problem is pride. Pride eats through what should be my soul and causes me to judge others for their arrogance. Pride prevents me from offering helpful tips about where others might find a fuller view of any given issue because I do not want to take the risks involved. Pride makes me shut up and shut out others. And the oh so sweet irony is that the frequent remedy seems all too homeopathic. My pride is best defeated by risking arrogance. 1.Wait, there are whales in streams? No wonder they fail so often! Who came up with these symbols?! Marc Cardaronella Since September, Marc has been on a roll with solid posts on “evangelization, catechetics and figuring out what works to bring people into union and intimacy with Jesus Christ in and through the Catholic Church.” Marc is the sort who gives me hope for the “new evangelization” and makes “intentional catechetical ministry” more than palatable. Be It Done After “discovering” this blog a few weeks ago after the author emailed me, I promptly read the entire (admittedly short) archives. Simply beautiful. Since October Melissa has blogged about her experience with endometriosis and fertility issues and God. It is one of those blogs that I don’t want my brother to ever stumble upon because he will be convinced that I have started yet another blog with a fake name. Writing Living Epistles Abigail writes a lovely blog about her life as a new mother and former Protestant. Since May her posts have ranged from stream-of-consciousness, to amusing list posts to beautiful reflections on often overlooked aspects of life. Pray Tell: Worship, Wit & Wisdom Affectionately known as “kiss, pray, tell” by me, this blog is one year old today, so I think that means it counts as “new” for 2010. I am not a part of the target audience of “pastors, liturgists, musicians, and scholars” but I do believe that Pray Tell meets its goal of being “informal, conversational, even humorous, but also – we hope – always well-informed and intellectually grounded.” And, unlike some other liturgy blogs which shall go unnamed, it has yet to make me want to cry. Blog on, Pray Tell! What are your favorite new Catholic blogs from this past year? One of the difficult things about moving to a new city and meeting new people is that I am faced with unusually challenging questions. Some of the questions are obvious parts of the job hunt and some of them are unfortunately stumbled upon by people simply trying to make conversation. It is not the questions themselves that are the problem; it is my answers. Most true answer: I don’t. I love to think about the future and am actually something of an obsessive planner. But not only do I feel no “control” over the future, I do not have any particular job/activities/anything else that I plan on fulfilling me. I want to live well. I want to love. I want to help others achieve their goals. I want to be so absorbed by my savior that all who interact with me interact with God. And so it does not actually matter whether I am consulting on “important” projects with 70-hour work weeks, answering telephones and filing, cleaning up bodily fluids, or washing dishes. I would love to have meaningful work that allows me to further the Church’s mission on earth, but even that isn’t necessary. What I really want is not at all dependent on what I do. The thing that matters is being fully in God’s presence while living. Question: So, why did you choose to attend that college? Most true answer: because I was going through a significant time of transition in my faith and it seemed to me that God wanted me to go to that college. I actually got a bad feeling when visiting the campus, and I was accepted at two of my dream schools, but I was so certain that God wanted me to do what I did not want to. And then the financial aid letter came in the mail and it was as if God was telling me that obedience was not going to be impossible. Most true answer: I like to visit new churches/shrines/monasteries, to read religious books, to blog about religious questions, to discuss theology with friends, to visit museums (and spend the time in the sacred art sections, or better yet, just make it an icon museum! ), to run (it is the best for praying through emotion!). Honesty of the fullest sort is good, but it sometimes conflicts with the essence of my vocation: living in the world in such a way that others can find God through me at points when they are not yet ready to approach the Church directly. 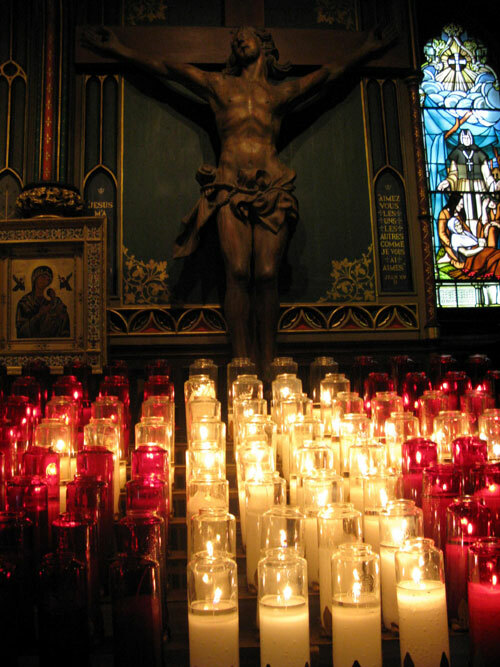 Even Catholics are often put-off by what they see as overly obsessive religion. And yet I do not want to lie, so I try to prepare ahead to have true, vague, and perhaps slightly misleading answers. But sometimes I am not prepared, either because the question is phrased in a new way or I simply was not expecting it at that point. And then I stumble over my words trying to figure out how to honestly seem normal. Advice welcomed! I would love your stories and suggestions for talking to others about your Catholic life without making it seem obsessive or crazy! I don’t think that I have ever mentioned how much I love Father Michael Kerper of the Diocese of Manchester (NH). His Q&A column in the diocese’s magazine is always a favorite and this past issue’s answer to “how can the church change the words of the mass?” contained a great explanation of the use of “God” and “Father” in the English liturgy. In the official Latin edition of the Sacramentary, the book of Mass prayers, almost every opening prayer begins with “Deus,” the Latin word for God. In old Latin-English missals, “Deus” was always translated as “God”. But in the late 1960s, after the Church authorized Mass in other languages, the group charged with creating an official English version of the Mass generally translated “Deus” as “Father.” Was this incorrect? Now, let’s consider the fluidity of language. About 10 years after “Father” became the accepted translation of “Deus,” the insights of Christian feminism began to influence the liturgy. Some asserted that masculine language about God somehow contributed to the inequality of women. Hence, some people — men and women — called for gender neutral language about God. They proposed replacing the masculine “Father” with the neuter “God.” Some objected to this, claiming that it violated long-established liturgical tradition. However, the Latin always favored “Deus” and rarely used “Father.” In a strange reversal, the “reformers” unwittingly advanced a traditionalist position. Which, then, should it be? Father or God? If someone wants a literal translation of the Latin or a gender-neutral term, “God” is preferred. If someone wants to express the loving and personal qualities of God, whom Jesus addressed as “Abba/Father,” then “Father” is favored. Neither word cancels out the other. Do you regularly read resources from dioceses other than your own online? Please share some of the best sources! Women of Mystery and Hope: “Mystery” is good marketing and “hope” is beautiful. What is your favorite way to think of religious life for women? Rebecca has a great series running on politics and religion. The comments have gotten heated, and seemingly so lopsided on the recent post that I felt the need to chime in and defend the guest poster. But even after deleting and retyping my comment three times I still needed to include a note to Rebecca that I would understand if she deleted it. So I decided to post my thoughts here rather than risking adding fuel to a fire on the blog of one of the kindest people I know online! Since I tend to be something of an over-zealous commenter myself, it is easy for me to recognize when others suffer from the same problems. It is not helpful to tell someone what she or he is saying. It can be useful to clarify that they mean what you think they mean, but simply telling them that they are setting forth a specific argument may only cause you to continue to miss the point. Admonishing sinners is a work of mercy, but implying that others are sinning due to different interpretations of the best way to achieve good is both uncharitable and ineffective. Even the pope backs up his statements with many nods to tradition and quotes from doctors of the church. It does not make sense to expect someone else to change her view of Church teaching by simply asserting an alternate view without a very careful examination of the sources (one quote does not count!). And this should obviously include her sources when she is citing the US Bishops! Deleted versions included a nod to JPII’s favorite politician and Ratzinger’s thoughts on conscience. What “rules” have you learned for getting across your point well in heated Catholic discussions? 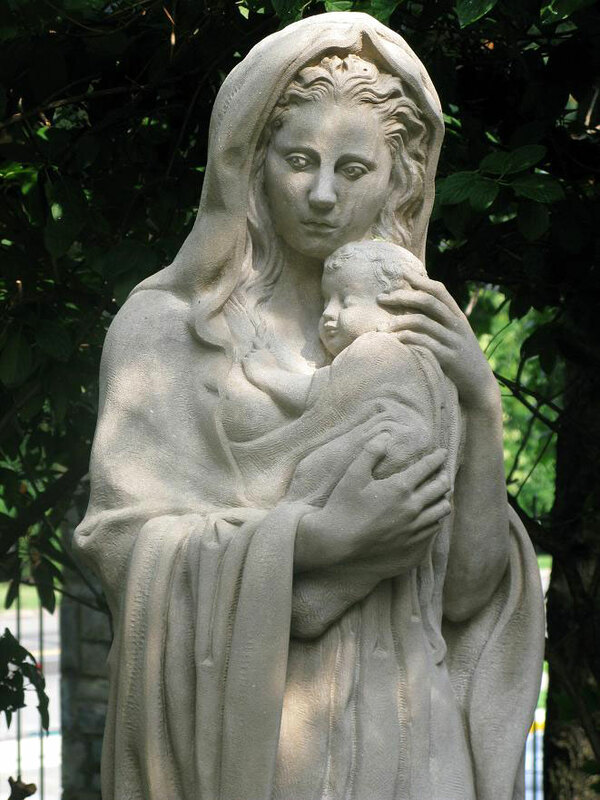 What do you call the mother of the Blessed Mother? The whole Dawn Eden vs. Christopher West debate strikes me as so odd. It seems that it is a typical blog-debate which it is not. It should be an intellectual academic tussle given the fact that Eden wrote a master’s thesis. As such, criticism of Eden for uncharitably attacking West is rather off-base. What did these people put in their college papers if they never contradicted anyone?! But the reality is that this is not pure academic tussle. West (and Eden, from what we have seen so far) is not a theologian. He is a popularizer of John Paul II’s theology. This makes his writing something less than a worthy opponent in an extended academic theological critique (at least I hope this is true at the master’s level). Also, Eden posted her speech from her thesis defense on her blog. While Eden was smart enough to close comments, the fact that she posted part of her critique of West on her blog naturally reduces it to blog-fodder rather than an academic discussion. Suddenly it is not a debate for those familiar with the typical love-hate relationships of dusty theologians, but an all out war between Catholic fan-clubs. And I sit back absolutely confused. I am pleased that Eden tackled some of the biggest problems that I have with West, but I am baffled by the attempted merger of academia and blogosphere. I am obviously a fan of blogs for cultivating discussion, but the “rules” of the blogs can never be the same as those of the university. Or can they? As I talked with brother bishops in preparation for this presentation, there was consistent agreement that one aspect that is most alarming to us about media is when it becomes unchristian and hurtful to individuals. For example, we are particularly concerned about blogs that engage in attacks and hurtful, judgmental language. We are very troubled by blogs and other elements of media that assume the role of Magisterium and judge others in the Church. Such actions shatter the communion of the Church that we hold so precious. Find the rest at the USCCB Media Blog.